The appointment of Jim Donald to succeed Bob Miller as chief executive officer of Albertsons Cos. earlier this month symbolizes the company’s ability to maintain its equilibrium when confronted with adversity and find new ways forward. The food/drug combination store operators’ strategic plan, which was centered on a merger with Rite Aid, was upended in August when the drug chain scrapped the deal after some influential stockholders said that they wouldn’t be fairly compensated under the terms of the $24 billion deal. Had it gone forward, the transaction would have resulted in a retailer with sales in excess of $80 billion a year and 4,900 stores in 38 states and the District of ­Columbia. By joining forces the two companies would have been well positioned to leverage their strengths in food and health care, creating a whole greater than the sum of its parts, and benefited from enhanced buying power, new revenue opportunities and hundreds of millions of dollars in synergy savings. The projected entity’s scale would have been particularly meaningful in the prescription drug business; with some 4,300 pharmacies it would have been a much more viable candidate for inclusion in preferred insurance networks than either Rite Aid or Albertsons are on their own. The aborted transaction would have enabled Albertsons to accomplish two other important objectives. Joining forces with publicly traded Rite Aid would have removed Albertsons, the current iteration of which was formed in 2006 with the backing of a group of investors led by Cerberus Capital Management, from the ranks of private companies and answered the question of finding a successor for Miller. Under the terms of the merger agreement, Rite Aid chairman and CEO John Standley was to have assumed the latter role at the combined company, with Miller serving as chairman. The naming of Donald as CEO adroitly addresses the succession issue, giving Albertsons a leader with a set of credentials on par with those of Standley and Miller himself. 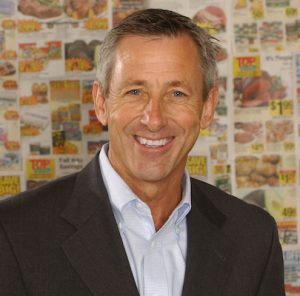 Donald, who joined the company as president and chief operating officer in March, started his 47-year career in retailing as a trainee at Publix. He subsequently worked for Albertsons, Safeway and Walmart, where he was recruited by Sam Walton to help create the company’s grocery business and Supercenter format. Donald served as CEO of Pathmark for seven years beginning in 1996, and was president and chief executive of Starbucks, where he led the chain to five consecutive years of earnings increases of more than 20%. He has also been CEO of the Haggen supermarket chain and Extended Stay America Inc.
Donald will need all those skills and more as he tries to fill Miller’s shoes. In just over a decade, Miller has succeeded in taking the unwanted remnants following the dissolution of Albertsons LLC, whose best assets went to Supervalu and CVS Health, and transforming them into the nation’s second-biggest operator of conventional supermarkets and a significant force in community pharmacy. The rapid evolution of what is now a $60 billion business that serves 34 million customers a week was fueled by the skillful execution of an aggressive merger and acquisition strategy. Two major milestones on that journey occurred in 2013, when the company bought back almost 1,900 stores from Supervalu, and 2015, when it purchased Safeway and its more than 1,300 retail outlets. Miller and his team have proven adept at the assimilation process, capitalizing on synergy savings and expanding market share, while simultaneously working to position the retailer to compete in an omnichannel world. Following in Miller’s footsteps won’t be easy, but with Donald’s impressive track record and promise of continued customer-centric innovation it’s a good bet that he’s up to the task.